Often, Canadian businesses miss out on the opportunity to receive grants and loans because they don’t have a clear view of what funding is available or how it relates to their upcoming projects. We routinely see businesses take this “reactive” approach to funding, where projects and financing are planned independently. This often leads to delayed projects that fail to secure enough funding and can never be implemented to their fullest form. Alternately, there are some forward-thinking management teams who understand the benefits of a well-planned financial strategy. These are the businesses who have a firm understanding of their strategic direction for the next 12-24 months and are exploring options (outside of retained earnings) to finance their activities. This “proactive” approach to funding ensures there is money available before the project gets underway, and that all deliverables can be implemented. To have the greatest chances of success with Canadian government grants and loans, small business executives should consider implementing a Proactive Funding Plan™. Proactive plans utilize management best-practices to help plan projects more efficiently while also securing more funding to pay for project expenses. To help you understand this concept, we’ve outlined the process of how your organization can build and implement a Proactive Funding Plan™. Download this resource now to start building your own personalized business funding plan. Although this concept is covered in-depth in Mentor Works’ How to Build a Proactive Funding Plan™ slide deck, it’s important to show everybody the basic concepts of what a Proactive Funding Plan™ is, and how it can improve your financing strategy. What is a Proactive Funding Plan™? A Proactive Funding Plan™ is an actionable plan that identifies your upcoming strategic priorities over the next 1-2 years and pairs them to the government grants, loans, and tax incentives most likely to make a positive impact on the project’s financing. Establishing Projects and Priorities: A written plan identifying an overall strategic direction over the next 12-24 months, and major projects that will help satisfy growth targets. Setting Major Timelines: Examining each of the priorities noted above to develop start and end dates, and well as major milestones and deliverables. Incorporating Government Impacts: For each of the business’ projects, identify impacts or outcomes important to the government (job creation, exports, etc.) so that a competitive case for funding can be made. How can the Proactive Funding Formula™ Accelerate my Business’ Growth? Once each of the three above steps have been completed, your organization will have a better understanding of your short-to-mid-term financial requirements, and if a funding gap exists. Funding gaps occur when companies identify several projects but do not have the internal capital to support them all. When this is the case, applying for Canadian government funding becomes essential to moving your project forward and accelerating your business growth. Step 3, the incorporation of government impacts, will become essential to your securing of additional funds. This is where you’ll be able to make a competitive case for securing business grants and loans from the government and improve your chances of success. Canadian small business managers and executives can learn more about building a Proactive Funding Plan™ by downloading Mentor Works’ slide deck, How to Build a Proactive Funding Plan™. The resource gives a step-by-step plan on how to develop a proactive management approach, and details how frequent strategic planning can lead towards greater return-on-investment for growth projects. 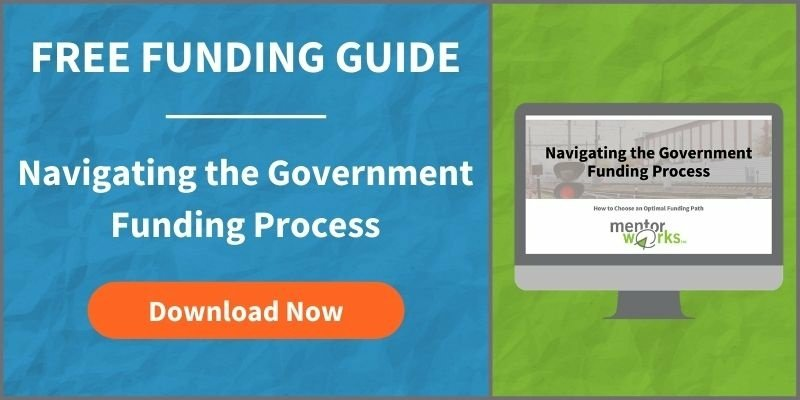 Download the How to Build a Proactive Funding Plan slide deck today to stop missing out on government funding programs.